Ross Wylie and David Fairbrother are set for the final two races in the 2017 Porsche Carrera Cup GB season as the championship heads to Brands Hatch to race on the famous Grand Prix circuit in Kent. Both drivers have worked hard throughout the season to get to grips with new machinery, as both have been competing in their first season in the championship. Ross will be hoping to secure second place in the Rookie standings, as he is just six points back in third place. In Pro-Am2, David Fairbrother is currently fourth in the standings, and will be looking for a strong finish on a circuit he enjoys, as he aims for third place in the title. “I love the full circuit at Brands, it’s got everything, it’s the best circuit in Britain to me,” said David. “We’ll give it a go. The first time I ever sat in the car was on the Indy circuit at the first race so we’ve got a bit more experience now. “I’m looking forward to it and to seeing how far we’ve come. To finish third in the championship in the goal I’m just going to keep finishing and keep finishing as high as I can. 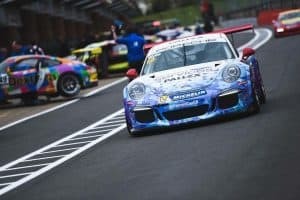 The Pall-Ex/Fuel Card Services branded, 460bhp 991 GT3 Cup cars lap the Brands Hatch GP circuit in around 90 seconds – over 90 mph on average – and will provide a real challenge for the drivers. “There are very few testing opportunities on the Grand Prix loop so everyone will be on the same page,” said Mark Jenkins, Team Principal at Slidesports. “We hope to increase Ross’ qualifying performance. Although we can actually generate the same lap time the skill is in switching the car and the tyres on early in the race and it’s a very fine balance. David and Ross will be taking part in two 45-minute free practice sessions on Friday 28th September at 11:30 and 16:40, with qualifying on Saturday 29th at 12:05. The two races take place on Sunday 30th September with race one at 10:40 and race two being shown live on ITV4 at 16:15.